It’s hard to pinpoint exactly what makes an Outward Bound course so magical. Being out on expedition ushers in endless possibilities. You are instantly invited to appreciate the beauty of living simply in tune with the natural world. There are new places to explore, opportunities to face your fears and the chance to learn what you are truly capable of. Through it all there’s a network of support beginning with two instructors and a group of strangers who quickly become family. Everyone in the group learns one essential lesson: we are stronger when we work together. Our traditional 30-foot sailboats encourage teamwork and leadership like no other classroom. It’s with this spirit of collaboration that we introduce our newest course, the Joshua Tree to Florida Keys Outdoor Educators Semester, affectionately dubbed “Trees to Keys.” It’s more important than ever to train our future leaders, and to instill in our students the values that are so deeply rooted in Outward Bound’s philosophy. The collaboration between Outward Bound California and the Hurricane Island Outward Bound School empowers students to explore and develop both leadership and expedition skills in two vastly different wilderness regions. The intent is to bring the best of both worlds to our students, and to allow them to develop the highest level of skill in each environment. The high desert, where rugged mountains and desert plateaus have been sculpted by wind and rain, meet in Joshua Tree. 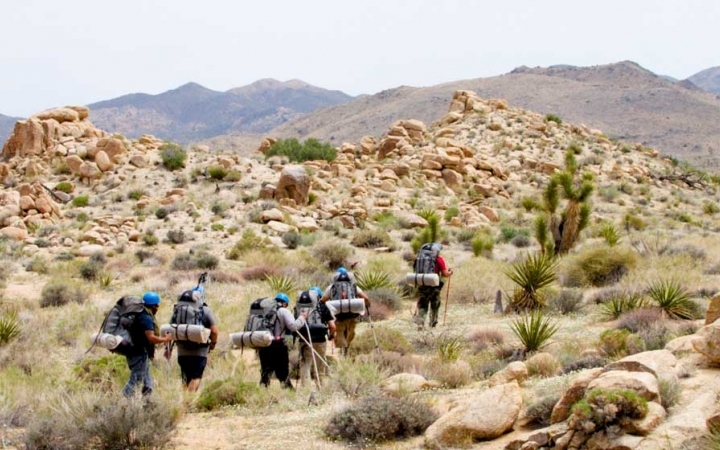 The expedition begins with backpacking in Joshua Tree National Park, well known for its challenging terrain and unique otherworldly landscape. Traveling both on and off trail, the students hike through boulder-filled canyons and across desert washes. The demanding terrain is a perfect place to begin pushing boundaries and stepping outside of comfort zones. The early days of a semester are especially important for laying down a strong foundation of expedition skills, creating a positive group culture and setting the leadership standard. With some of our most tenured staff at both schools developing curriculum, and senior instructors teaching in the field, this semester showcases our highest level of professionalism and quality instruction. Joshua tree is known as one of the premier climbing destinations in the states. Our instructors emphasize continuity between the elements, drawing from skills and lessons learned as they transition from backpacking to climbing. The dramatic boulders, gneiss and granite provide countless opportunities to learn, grow and hone personal climbing skills. In addition to teaching climbing techniques, opportunities are created for the students to step into the role of facilitator in the outdoor classroom. The group travels midcourse to Florida to participate in a Wilderness First Responder training. The transition also introduces new instructors, exposing the students to different leadership styles and role models. Although the setting has changed, the goals remain the same. An immersive sailing expedition will now provide the students with hands-on learning opportunities to continue developing the knowledge and skills specific to becoming an effective leader, role model, facilitator and teacher in the outdoors. As the group learns to sail, navigate and live aboard an open vessel, they have space and time to put all of their new knowledge to use. 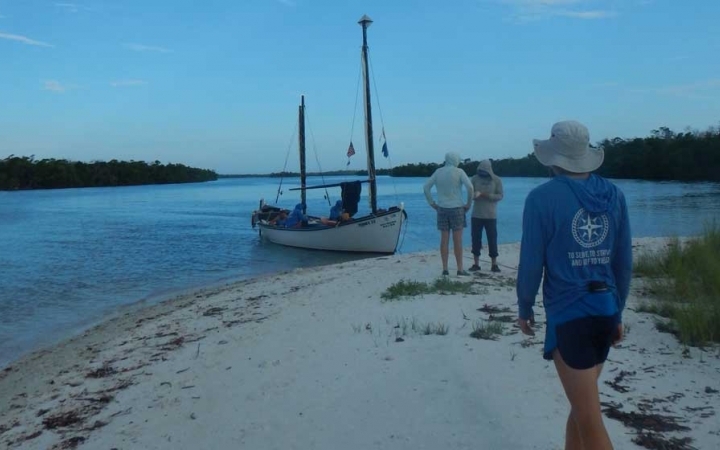 Traveling through Florida Bay and the Everglades, the group takes turns teaching each other lessons. There are shallows to navigate around and currents to asses. The group needs to work together, use good judgment, and assess risks appropriately. There will be opportunities for individuals to rise up as leaders. Embraced by blue waters, countless Pelicans and brilliant stars, the semester ends with a student led final challenge. It is a once in a lifetime chance to take charge of a small boat full of peers and to showcase newly acquired skills, effective leadership and followership, and versatility. A successful final illustrates that we are stronger when we work together. Stay informed on Outward Bound School news and updates!